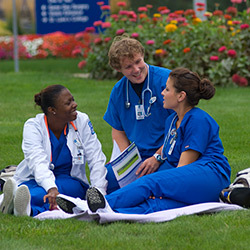 Admission applications for the academic programs at St. Luke's College are reviewed on a continual basis with academic programs beginning in the Fall (radiology, respiratory care, nursing) Spring (nursing), and in the Summer (Phlebotomy). Bachelor's degree and general education courses are offered in each semester. Applicants are encouraged to have all required documents submitted well in advance. Graduation from high school with a minimum cumulative grade point average of 2.50 or completion of a high school equivalency examination such as GED or HiSET. Complete the American College Test (ACT) with a minimum composite score of 19, or an equivalent score on a comparable examination. Applicants who do not meet the above criteria may be considered upon completion of transferable college coursework with a cumulative grade point average of 2.30. College coursework will be evaluated on the quantity, quality and relationship to the St. Luke's College curriculum. In addition, program specific requirements may include: job shadowing, personal references and participation in a personal interview. The international applicant is subject to all College admission policies as well as regulations of the United States Immigration and Naturalization Services. Due to limited resources to support international students, St. Luke's College does not authorize request for temporary or student visas. Applicants for whom English is a second language must submit a Test of English as a Foreign Language (TOEFL) score of 61 or above of iBT-internet based or 500 or above if PBT paper based. Completed financial documents demonstrating that funds necessary to cover tuition and living expenses are available while enrolled at the College. Applicants need to be able to read and write English and speak English in such a way as to be understood.